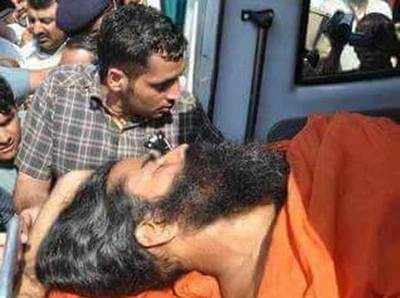 A rumor of Baba Ramdev dying in a road accident on the Mumbai-Pune highway went viral on social media on Tuesday. The hoax message with the image of a bearded man being carried on a stretcher and taken to an ambulance caused a stir all around. However, it turned out that nothing unfortunate had happened to the Yog Guru and the news as well as images were fake. Baba Ramdev tweeted about the yog shivir he was conducting the same day in Haridwar. He also informed people about his well being and asked them not to believe in any rumors. Reportedly, the image that accompanied the message is from an incident in the year 2011 when Baba Ramdev became unwell during an Anshan (hunger-strike). @yogrishiramdev @Ach_Balkrishna @bst_official @tijarawala @AvdheshanandG Babaji , we need u for 1000 yrs more. @yogrishiramdev@Ach_Balkrishna@bst_official@tijarawala@AvdheshanandG GOD can’t be so cruel I knew that My Sadguru has to change the world he has the Power Of Kaal(time). I’m proud to be his pupil. KRK Said Something To Bhakts, And It Is Outrageous!